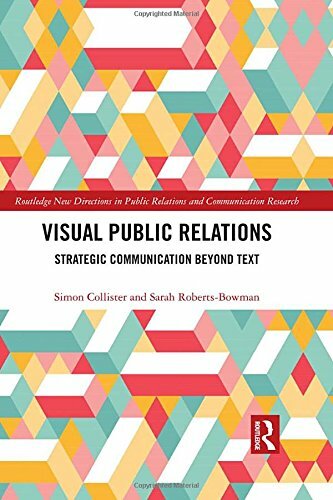 I’m delighted to post that I have a new edited collection out with Routledge: Visual Public Relations: Strategic Communication Beyond Text. 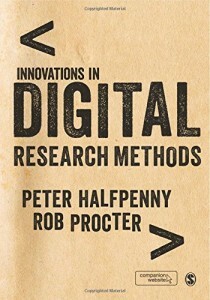 Working with former colleague, Dr Sarah Roberts-Bowman from Northumbria University, we’ve put together a collection that we believe offers a really interesting – and challenging – account of strategic communications that brings together a range of inter-disciplinary ideas to close down gaps in scholarship. [W]e believe that non-textual domains of media and communication have been left largely unexamined within the field of public relations and strategic communication. Starting an exploration of the visual and spatial aspects of the fields will play a significant role in closing – or at least, beginning to close – a conceptual gap in the literature. … [S]uch a project will initiate and encourage interdisciplinary thinking and approaches to public relations and strategic communication. As this chapter (and the collection itself) progresses, the need to seek out and bridge conceptual divides with other, related fields, such as cultural and critical theories, design and anthropology will hopefully become clear. In short, we are confident that by connecting broader perspectives on the visual and spatial dimensions of culture and media with public relations and strategic communication, a much-needed opportunity for furthering theories about, and research into, these fields can be developed. More information is available on Routledge’s New Directions in Public Relations and Communication pages. The book is available via Amazon (UK). The aim of this conference is to bring together strategic communicators working in civil society and academics to explore and discuss the role of public relations theory and practice in shaping emerging and existing societies. In recent years some public relations scholars have adopted a sociological perspective on strategic communication. This view sees the discipline as actively constructing and structuring the world in alignment with a number of structural forces – often corporate, governmental or state-based. Such theories draw on a socially constructed epistemology (Heide, 2009; Ihlen and van Ruler, 2009) through which strategic communications practice “produce[s] a common social reality” (Heide, 2009: 43). Applications of these sociological analyses have tended to operate either at a theoretical level (Ihlen et al, 2009) or from a distinct critical perspective, employing concepts such as discourse theory or adopting readings of public relations as a cultural intermediary (Hodges, 2006). 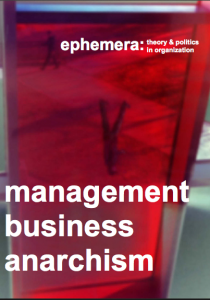 The aim of this conference is to move beyond studies of what could be considered meso-level activities, such as marketing or corporate communication campaigns (Ihlen and van Ruler, 2009: 3) to focus scholarly attention on, arguably, macro-level communications activity and the ways it is responsible for shaping the values and norms of societies. Defence – how are the military and intelligence agencies using communication strategically to prepare for, manage and embed specific state-focused or governmental aims? For example, how are ‘information ops’ deployed to destabilise hostile regimes; how is public relations used to communicate with civilians in conflict or post-conflict zones; how can strategic communications be used for coalition-building among local stakeholders (politicians, tribal elders, aid agencies, etc)? Diplomacy – what communication strategies adopted by governments or inter-governmental organisations, such as the UN or NATO, are used to achieve opinion or behaviour change? This could include studies of inter-governmental lobbying for policy or regime change; the role of social media in engaging civilians as part of ‘public diplomacy’ campaigns; how can strategic communication – both interpersonal and external – be used in negotiation situations, e.g. terrorism, back-channel diplomacy, peace negotiations, etc? Development – how is public relations used by stakeholders in supporting social development? This could include direct public-facing activity by NGOs and aid agencies, such as in-region public health awareness campaigns, the use of public relations in lobbying for aid budgets and aid programmes. Also, what role does PR play in higher ideas around progress, social integration, peace and social justice. Although these themes lend themselves to the ‘global tasks’ facing public relations, we are also interested in receiving submissions about public relations’ role in shaping established societal frameworks – providing they cover some of the main issues raised above. We welcome submissions that adopt a critical as well as functional account of public relations in the above contexts. The overarching aim of the conference is to encourage collaboration and partnership between practitioners and academics to develop new thinking across the field. We encourage challenging and thought-provoking proposals from individuals, groups or organisations. The best papers will be selected to go for review by the Journal of Communication Management who will publish a Special Issue in support of the Conference. If you would like to submit a paper for presentation at the conference, please email abstracts (400-600 words) to prglobaltasks [at] gmail [dot] com. 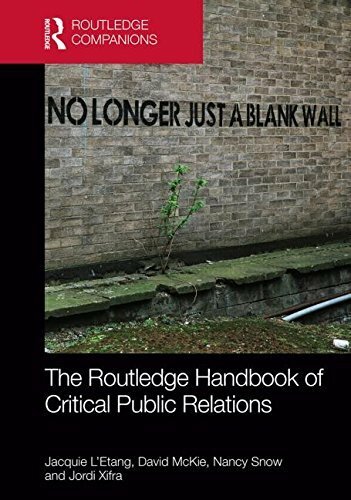 I’m happy to s ay that my chapter, ‘Algorithmic PR: Materiality, Technology and Power in a Post-Hegemonic World’ has been published in the newly launched Routledge Handbook of Critical Public Relations. Critical theory has a long history, but a relatively recent intersection with public relations. This ground-breaking collection engages with commonalities and differences in the traditions, whilst encouraging plural perspectives in the contemporary public relations field. 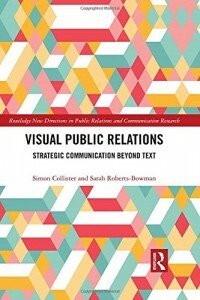 Compiled by a high-profile and widely respected team of academics and bringing together other key scholars from this field and beyond, this unique international collection marks a major stage in the evolution of critical public relations. 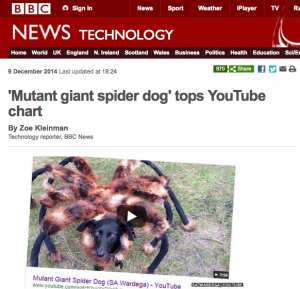 It will increasingly influence how critical theory informs public relations and communication. The collection takes stock of the emergence of critical public relations alongside diverse theoretical traditions, critiques and actions, methodologies and future implications. 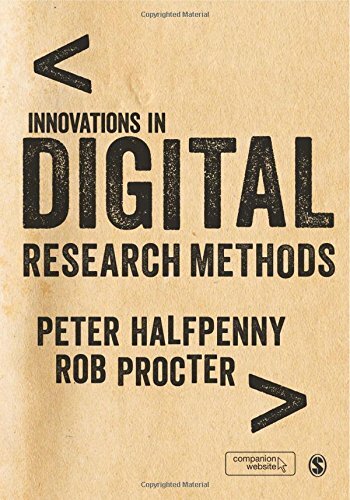 This makes it an essential reference for public relations researchers, educators and students around a world that is becoming more critical in the face of growing inequality and environmental challenges. The volume is also of interest to scholars in advertising, branding, communication, consumer studies, cultural studies, marketing, media studies, political communication and sociology. More info from Routledge here. As a member of the CIPR’s Social Media Advisory Panel I spent a fun afternoon last Wednesday taking part in a ‘PR Hackday’ on the subject of paid media. It was a good session with lots of productive discussion – both within the room and with practitioners at large via a Twitter Q&A. Paid Media is major opportunity for the PR sector, but there’s a risk that PR will fall (further?) behind competing industries if they don’t recognise the opportunities and do something about it. At least one participant in the Twitter Q&A remarked that paying to amplify messages or content wasn’t PR’s job. Could you ever imagine hearing an advertising or SEO agency saying: “We don’t do earned media. That’s PR.”? Take a read/listen/watch and tell me that PR doesn’t do paid! I was asked to speak at the recent MIPAA PR Masterclass event about convergence and continuity in the PR industry. I spoke about how the rise of ubiquitous digital media and, importantly, the computational layer that sits underneath all digital media is creating challenges for PR as a discipline and at a practical level. I argued that algorithms play an increasingly significant part in determining what information we get to see, how we analyse and make sense of it as well as how our carefully crafted messages are mediated, manipulated and received. I also discussed how the increasingly default nature for digital narratives is that of a fragmented datastream, rather than a coherent narrative (see Lev Manovich’s post). And then for reassurance I suggested ways in which current practitioners could address and ensure a sense of continuity in terms of what they do on a day-to-day basis. 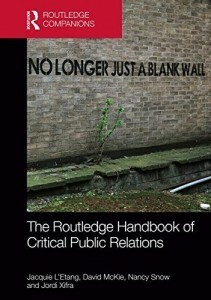 Some of the ideas and themes I took from a forthcoming chapter I have in the Routledge Handbook of Critical PR. Another quick link post featuring a series of comments I made for BBC News this week regarding the release of Google and Facebook’s top trends 2014. You can read my incisive commentary over at the article. 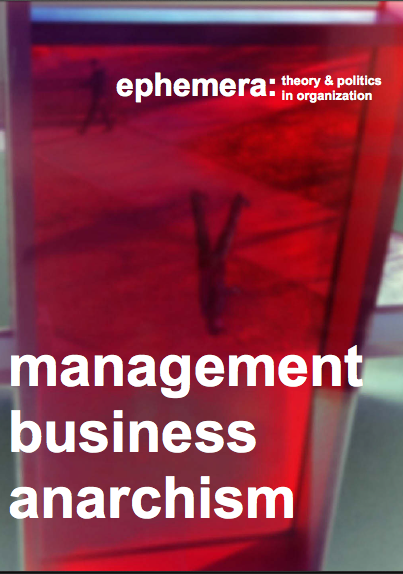 Just a short post to tell you about a new article I have published in the current issue of the journal: Ephemera: theory & politics of organization. Last night was the second of our LCC PR Guest Lectures, supported by Precise: media monitoring and evaluation. Weber Shandwick’s UK & EMEA CEO, Colin Byrne, gave a great overview of the direction the PR industry is heading. He covered a lot of areas that most smart practitioners regularly allude to, but gave some useful contextual insight and evidence to argue for a cohernent future direction. More information (and how to book) on the two remaining FREE PR guest lectures is here. I was offered the opportunity to submit a written response to the House of Lords Select Committee on Digital Skills in my capacity as member of the CIPR’s Social Media Advisory Panel. My submission covered issues such as digital skills education, the future of work and the higher education system has been accepted and can be found in the Committee’s latest publication. To save you trawling through the document, however, I’ve pasted my responses below. Enjoy! Q. 5 How are we teaching students in a way that inspires and prepares them for careers in the future workforce in occupations that may not yet exist, rather than the current one? How can this be improved? From experience of teaching undergraduates, postgraduates and professionals, it can be argued that there is still too much emphasis on classroom or lecture based teaching, taught to syllabi that are out-dated – or not necessarily reflective of emerging or transforming occupations – and are limited to rapid change or development due to bureaucracy within higher education or professional bodies. Given the highly practical and technical as well as experimental nature of some elements of digital knowledge and skills it is important for students to gain hands-on experience of technology and its application in specific fields. This can be limited by the syllabi of courses and qualifications which tend to be taught by academics and professionals not familiar with new or emerging products or techniques as well as the facilities of education institutions which remain wedded to lecture theatre and classroom style teaching. The provision of ‘wired’ teaching spaces or computer-labs can be scant and, where it does exist, highly popular making it difficult to reserve and teach in. As well as infrastructure limitations, education is also held back the scope of syllabi which remain unchanged and rooted in non-digital content. Part of this is linked to out-of-touch, established tutors as addressed above, but it is also partly to do with the laboriousness and time-taken to review and re-validate course content. The additional work and duration of this process is prohibitive to updating and adapting courses to new and emerging technologies, knowledge and skills. Q. 7 How can the education system develop creativity and social skills more effectively? The answer provided to Q. 5 above provides part of the context and answer to this one as well. However, the issues that require addressing to help the nations’s education system develop creativity lie pre-higher education and within the approach schools take to teaching and learning. For example, many undergraduate and postgraduate students encountered through my experience are overly focused on learning the ‘facts’ required to pass assessments, rather than recognising the ability to think critically and creativity and value the ‘process’ of knowledge exploration and development. Anecdotal research among student cohorts across a number of years indicates that this approach to learning stems from GCSE and A-Levels where the goal is not to develop techniques for learning per se, but rather ‘learn’ the exam inputs required to pass. By extension such an approach to teaching may well stem from schools’ desire to achieve successful results in order to satisfy league tables. Locked into this approach is a highly detrimental way of learning which overlooks the value in self-directed exploration, creative thinking, experimentation and a recognition that coming up with creative ideas, trying them out, failing and adapting them is an important skill set to possess in contemporary society. I’m not sure the education system has a primary responsibility for developing social skills. Q. 8 How does the current post-16 system inspire and equip students to pursue careers in the future workforce in occupations that may not yet exist? How can this be improved? Education and other state systems can be notoriously process-driven and focused on outputs rather than critical and creative thinking. In some respects it may be worthwhile developing partnerships with credible third parties to help students identify, understand and pursue careers in the future workplace. Linked to my response to Q. 7, one of he emerging areas of the economic and employment landscape is the increasing rise of individual responsiveness and entrepreneurship. Driven by digital technology’s empowerment if individuals and its fragmentation of existing industries this trend emphasises – at least presently – the opportunities for individuals to identify problems and develop solutions, either as start-up organisations (e.g. AirBnB, Uber, etc) or as individuals (e.g. the freelancing of traditional career paths and roles). Enabling students to think creatively, explore and test opportunities and even fail are key skills to be equipped with in such a broad, entrepreneurial economic environment. Q.9 How can the digital sector be supported in the short- and medium-term? What is the role for higher and vocational education, national colleges, industry, and industrial policy? In terms of the short and medium-term role for higher and professional/vocational education, more emphasis needs to be placed on understanding through research and embedding through teaching the key core knowledge and skills, e.g. techniques, ethical implications, successful applications, etc, of the major trends in the digital sector. These will be high-level insights and not necessarily available from existing workplaces or on course curricula. Extra funding for research and curriculum development will be key. One potential limitation for education is the growth of commercialised involvement in elements of the digital sector. The once open field of the Internet and ‘social media’ is fast being consolidated, commercialised and hide away behind patents and copyright. While tho is arguably inevitable in a market economy it means that teaching the application of popular or widely-used tools, technologies, platforms, etc will require ether partnerships with or licences for proprietary products. This is something that would potentially restrict education providers to limit student expose to one or two key technologies given exclusivity clauses or often exorbitant costs.